A short-circuit at the world's largest proton smasher has indefinitely delayed the particle-hunting machine's planned restart, the European Organisation for Nuclear Research (CERN) said on Wednesday. The LHC is a 27-kilometre (17-mile) ring-shaped tunnel, in which two beams of protons are sent in opposite directions. 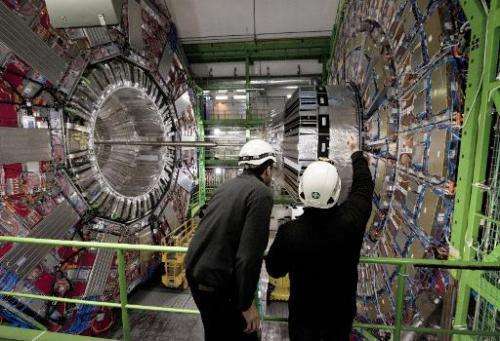 In 2012, scientists at CERN, one of the world's top research centres on particle physics, announced they had discovered the Higgs boson, until then only theorised as the mass-giver to all matter—a feat crowned with the 2013 Nobel Prize in physics. That is the entire article -- nothing else pertains to the headline -- NOTHING ELSE -- i am going to go out on a limb and HOPE this was generated by a computer. 345+ characters left to go. Actually, not only is the residual of the article filler, but its not very good filler. I've seen estimates of the amount of wire used, for instance, as well as typical power levels (although during start-up no doubt current is quite a bit less) which would lend some (better) perspective. Also note that the article goes on and on about a 2012 'discovery' 3+ years ago and *nothing* about what its going to be looking for once its back up (ie additional Higgs as well as supersymmetric particles). Finally, what does "post short-circuit repairs" mean? I suppose that is to distinguish them from repairs done PRIOR to the short? Probably got a signal from the future with those FTL neutrinos.Duh. It also doesn't note that due to the huge size and complexity, such accidents aren't surprising...AND that any delay is really really not good - careers are hurt (or helped) and funding is affected. Well, it certainly appears someone blinked... again. the magnets need to be "trained" to get to the field levels they need to steer beams at the higher energies round in a complete circle. The forces on a one-inch x-section of coil are in the hundreds of tons, so all the windings end up squished into one corner of the winding volume, their plasticity is important to allow them to do this without breaking. Typically it takes several "goes", which is why it is likened to training. i think they anneal inbetween if they can, though that can take 3 months. If you get a break or a short then its bad, warm the machine, replace the magnet, cool down, train-up the new coils. Obviously the new guy is a bit behind on training and more likely to fail, but you can't have one magnet doing only 6 Tesla when the others are doing 7. Glad to see that was halted for a minute. Too bad, but hopefully it isn't anything damaging in the long term. Well if it is well understood could you give us an idea of what it was. We would like to know more about it. It is a magnetic short circuit, an electrical short circuit, an arcing issue. Is the current strength for new magnets too strong for the wire shielding. It would be nice to know what the problem is. "It is a well understood issue, but one that could take time to resolve,"
I get the impression that it is very bad and embarrassing. At any rate, it is a basic in electrical circuits design to have a short-circuit protection mechanism in place. That said, it seems that somehow, probably a technician's error, the short-circuit protection was overridden, and that could mean the whole coil is fried. I am saddened to hear this. I hope they are able to get it taken care of quickly. Patience isn't my strong suit and it feels like its been forever already. Ps. Vic, sorry bout that 1 vote. My finger slipped. Could be the delay at the CERN LHC is welcome by its administrators, who may need time to craft a reaction to recent Journal of Binary Mechanics articles which have methodically documented the outdated "fantasy science" embraced by CERN research groups. Seen by a wide audience in the physics community (e.g., "If you want to keep your Higgs boson..."), these articles expose a sort of mismanagement where clear flaws in discredited Standard Model mathematics may have been covered up perhaps for public relations reasons. Recall that the present situation where the Higgs mass mechanism is actually old news appears to be yet another CERN research group snafu following the so-called "faster than light" boondoggle several years ago. Scientific rigor may have suffered as the one billion Swiss Franc budget may have clouded judgment where intellectual integrity and keeping a paycheck compete. Do you mean the blogspot page or the facebooklinks? As powerful superconducting magnets are normally built with a large copper 'short circuit' shunt (to handle the current bypass in case of a quench) : An unwanted 'superconducting short circuit' couldn't show up until the whole assembly reaches its few Kelvin operating temperature. Most of the time delay will be to warm and cool the whole assembly without further damage due too uneven expansion.